We return to Two Rivers Vermont as a young boy discovers his artistry and his parents mature and discover their son and themselves through the mutual love of Grace. It reads like a mystery as chapters alternate between 4 characters and the language is as emotionally and beautifully written as the characters are emotionally detached from each other. 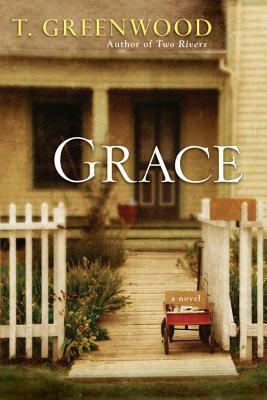 T. Greenwood's extraordinary novels, deftly combining lyrical prose with heartrending subject matter, have earned her acclaim as a "family-damage specialist" (Kirkus). Now she explores one year in a family poised to implode, and the imperfect love that may be its only salvation. Every family photograph hides a story. Some are suffused with warmth and joy, others reflect the dull ache of disappointed dreams. For thirteen-year-old Trevor Kennedy, taking photos helps make sense of his fractured world. His father, Kurt, struggles to keep a business going while also caring for Trevor's aging grandfather, whose hoarding has reached dangerous levels. Trevor's mother, Elsbeth, all but ignores her son while doting on his five-year-old sister, Gracy, and pilfering useless drugstore items. Trevor knows he can count on little Gracy's unconditional love and his art teacher's encouragement. None of that compensates for the bullying he has endured at school for as long as he can remember. But where Trevor once silently tolerated the jabs and name-calling, now anger surges through him in ways he's powerless to control. Only Crystal, a store clerk dealing with her own loss, sees the deep fissures in the Kennedy family--in the haunting photographs Trevor brings to be developed, and in the palpable distance between Elsbeth and her son. And as their lives become more intertwined, each will be pushed to the breaking point, with shattering, unforeseeable consequences.